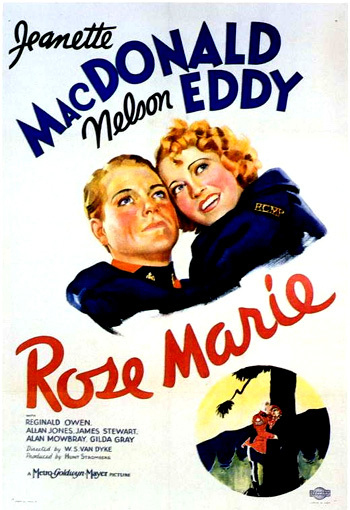 Rose Marie (1936) is the film with the best-remembered pairing of "America's Singing Sweethearts." The film opens in Montreal, Canada where headstrong, celebrated opera soprano singer Marie de Flor (Jeanette MacDonald) is on a successful opera tour. She pleads and appeals to the premier of Canada (Alan Mowbray), who is an ardent fan, for the prison release of her younger brother John Flower (Jimmy Stewart), convicted for bank robbery. But then she learns that he has killed a policeman during a prison breakout and fled as an escaped convict. He has fled into the NW Canadian wooded wilderness. With all her savings, she leaves the opera and goes there with Boniface (George Regas), a half-breed guide, in search of her brother. Also on his trail is handsome Canadian Mountie, Sgt. Bruce (Nelson Eddy). Marie is double-crossed, robbed and dumped by her hired guide, so she gets a job singing in a bawdy dance-hall saloon in order to survive. Her refined soprano voice is out of place and she is not appreciated by its uncouth patrons. She receives advice from one of the other entertainers Bella (Gilda Gray) to sufficiently vulgarize her act, in order to keep her job. While performing, the sergeant enters and recognizes her as a star. He rescues her from her situation and helps her through the wilds, trailing and finding Boniface, and restoring her savings. She re-hires Boniface as her guide. Sgt. Bruce, while falling in love with Marie, learns of her relationship to the fugitive. He knows his duty and responsibility is to pursue John, however. He believes that when he leaves her, she will probably lead him to her brother, so he trails them. Once again, the untrustworthy Boniface, fearful of the pursuing Mountie, abandons Marie. Bruce assumes responsibility for her. They soon fall in love. In their love scenes, they communicate through song, usually accompanied by a full orchestra in the background. The film's most memorable signature number is their glorious duet together, "Indian Love Call." When she locates her brother, duty demands that the Canadian Mountie take the fugitive into custody. Her fugitive brother is arrested and returned to justice. Marie is distraught, but returns to the world of the opera. Her emotional condition is anguished, and she suffers a nervous breakdown while performing. While convalescing, Sgt. Bruce is sent for. He returns to her side and they are reunited, and she regains her will to live and love.